I love Halloween. Supernatural inspiration is at every corner or at least on each wall of the local costume store. We have a large one that is only open this time of year. 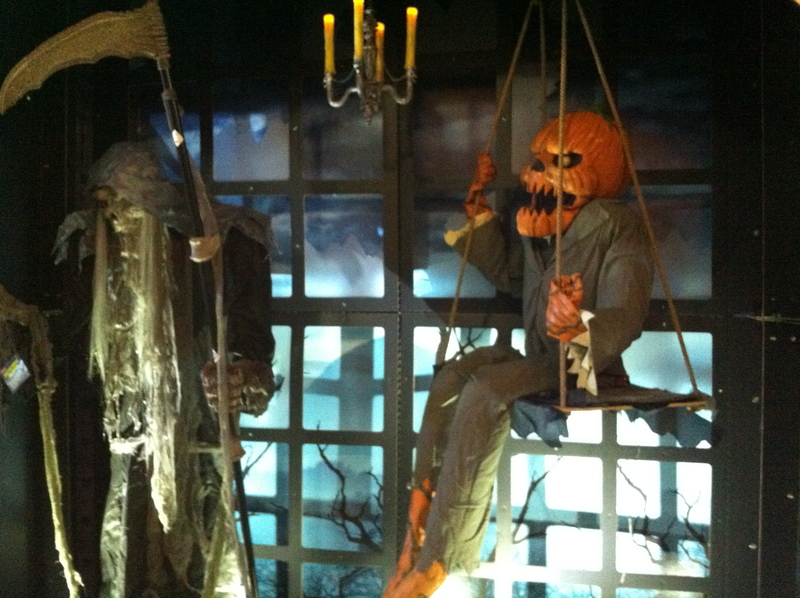 Along with the usual costumes and bloody appendages they offer small artfully arranged macabre mechanical vignettes. I love these tiny horror moments. Ghosts stalking, people stabbing, and creepy things coming out of the fireplace. As an author the story possibilities are many. So I snap a few quick photos to jog my memory when I need a spooky idea. If I’m lucky I find some small items to add to my inspiration wall to help me along the rest of the year. My haul this year included two small decorated pointy hats just right for my Sweetwater Witches. They go perfectly with my “Embrace your inner Witch” plaque. I loved all kinds of horror when I was growing up. By todays standards Vincent Price might be a little tame but back in the dark ages of my youth his movies fit the bill. It took a lot to scare me back then. I devoured Stephen King and Clive Barker books and then watched the films. I loved to stay up late to watch Elvira, Mistress of the Dark. She was funny and always showed the best movies. So tonight I’m snuggling in with some great horror flicks and soaking up the vibes. Favorite Halloween memories? Movies? Books?